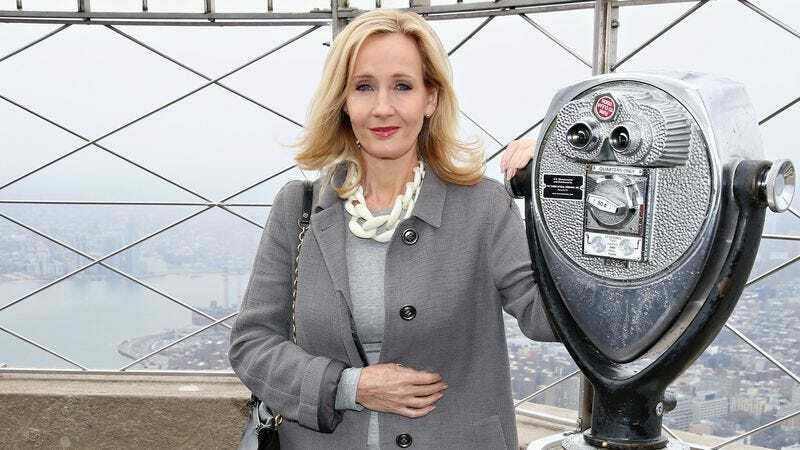 According to Entertainment Weekly, J. K. Rowling has responded to criticisms over her decision against joining a cultural boycott of Israel in a manner her fans know quite well: a preponderance of exposition involving Albus Dumbledore. In February, more than 100 U.K. artists launched the cultural boycott, explaining in a letter published in The Guardian that, “Palestinians have enjoyed no respite from Israel’s unrelenting attack on their land, their livelihood, their right to political existence” and that, because of this, the artists refuse to share their various works and teachings with Israel. Yet, many Harry Potter fans were still confused by her rationale, so of course they took to the Internet to compare Israelis with Voldemort and the Death Eaters. Sighing, Rowling grudgingly agreed to play their game, wishing that just once someone would use The Casual Vacancy for some kind of misguided political allegory. So, the author wrote another TwitLonger piece, this one using a scene from Harry Potter And The Deathly Hallows to demonstrate her position. For those who love it when Rowling is roped into writing about Harry Potter again, remember that her play Harry Potter And The Cursed Child is coming to the London stage next summer and will likely run for a while. Also, the Israeli-Palestinian conflict will probably continue for a bit longer as well, so perhaps Rowling hasn’t given her final words on that matter either.